Planned Maintenance automatically generates work order batches each day from your active PM schedules. You can print the batch of work orders as well as change the status on each work order from one convenient screen. From the Planned Maintenance home page, click the Print PM Work Orders link under the Quick Launch section on the left hand side of the screen. Find the batch you would like to print and click on the Batch Number to view a list of the work orders. Click on the Print Batch link located at the top right of the Work Order list. You will now see the Change Batch Print Statuses screen. If you just want to print your batch and not change the status of the work orders, click the Submit button at the bottom of the screen. You can change the statuses of the work order as a group from this page as well. Find the current status the work orders are in. Select the new status for these work orders from the drop down box on the right. 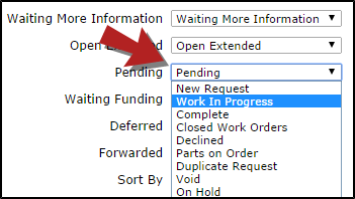 For example, if you want all of the pending work orders to be changed to Work in Progress, you would locate Pending on the left side of the list and then select Work in Progress from the drop down list next to it. A print preview of the work orders forms from the batch will appear in a new window. You can use the browser's print function to send these work orders to your printer.